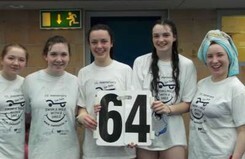 Last Friday our TY year group participated in the annual Ian Daly Swim A Mile With A Smile. We had all split up into groups, in my group was Ciara, Chanice, Muireann and myself! We started off swiming slowly but as we continued to swim Chanice and I decided we would swim the mile by ourselves. So, in the end our group swam a total of three miles! We all had great fun at swim a mile, and afterwards we even spent an hour or so in the local shopping centre Blanchardstown!